In patients with chronic venous disease (CVD), there is a variety of symptomatic manifestations, as well as a variety of treatment options available to manage the disease and alleviate the symptoms. Evidence shows that patients benefit from pharmacologic treatment and lifestyle advice to improve quality of life, symptom severity, and ulcer healing. High-quality studies have shown that venoactive drugs, such as micronized purified flavonoid fraction (MPFF) and other flavonoids, are essential tools for healing ulcers and controlling edema. The VEIN Act program served as a worldwide collaboration to study patients with symptomatic CVD (clinical, etiological, anatomical, and pathophysiological (CEAP) classes C0 to C6), where medical therapy was offered at the initial office visit. End points of interest included symptom relief after 3 months of noninterventional therapy with venoactive drugs, educational and lifestyle advice, and the use of compression stockings. The results showed that symptoms, including leg heaviness, pain, swelling, and cramps, decreased 3 to 4 points on the visual analog scale at the follow-up visit. Overall patient satisfaction was also recorded, with 72% of patients reporting being “very” or “extremely” satisfied with therapy. These results suggest that, by combining pharmacologic interventions with MPFF, education, and compression stockings, a considerable group of patients can achieve an improvement in their symptoms. A molecular pathway explaining the manifestations of CVD has been proposed by several authors.3 Inflammatory pathways on the venous endothelium, which are activated by unknown triggers, promote leukocyte infiltration and activation, wall deterioration, and capillary leakage. This proinflammatory microenvironment damages the subcutaneous cellular tissue, skin, and nerves on both the dermis and the vein wall.4,5 Understanding these pharmacological pathways leads to a more effective treatment of CVD by means of venoactive drugs (VADs) and compression stockings.2,6 Definitive treatment usually involves a vascular intervention, but, for a significant subset of patients, symptom relief can be achieved gradually after the first consultation and by using nonsurgical therapies.2,6,7 These therapies include, but are not limited to, the use of compression stockings or elastic bandages, oral and/or topical VADs, exercise, postural recommendations, and skin hydration. We focused this study on patients with symptomatic CVD in which medical therapy was offered at the initial office visit. End points of interest included symptom relief and an improvement in quality of life after 3 months of noninterventional therapy. 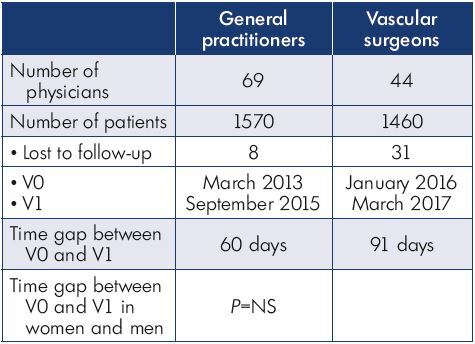 The VEIN Act program was a multicenter prospective observational study with participation from institutions from Colombia, Central America, the Caribbean, and Europe. It included adult patients with at least one symptom or sign attributable to venous insufficiency who consulted a general practitioner or vascular surgeon participating in the study between March 2016 and April 2017. The main complaint was lower limb pain. At the initial office visit, the physician prescribed a nonoperative treatment and scheduled the patient for a second visit 2 to 3 months later. Patients were classified according to the clinical, etiological, anatomical, and pathophysiological (CEAP) system (using only the clinical “C” grading).1 At the follow-up visit, the physician recorded treatment compliance and changes in symptoms and quality of life using a survey (Table I). Table I. Distribution of patients between physician groups. Abbreviations: V0, initial office visit; V1, follow-up visit. At the follow-up visit, the physicians evaluated the effectiveness of treating the symptoms. Criteria for this aspect included symptom relief, quality of life, and overall patient satisfaction. Tools used to measure these aspects included a visual analog scale (VAS) and a quality of life questionnaire to track self-reported symptoms. A total of 44 vascular surgeons, 69 general practitioners, and 3030 patients participated in this study. Patient characteristics are presented in Table II. Table II. Patient characteristics between physician groups. Most patients were female and had mild-to-moderate disease, with 22% classified as C1, 31% C2, and 24% C3 (Figure 1). Body mass index (BMI) showed an overweight population with an average BMI around 26 kg/m2. 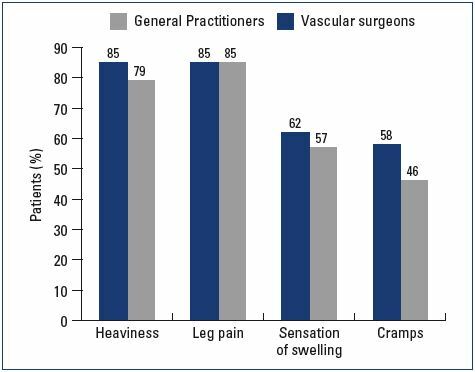 Of the patients visiting a general practitioner or a vascular surgeon, 22% or 36%, respectively, had already received treatment for leg problems. The severity and type of symptoms were also comparable between patients from both groups. 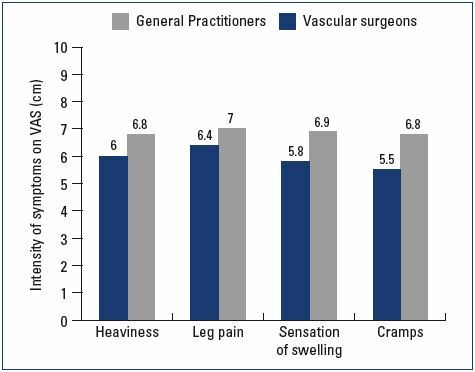 Heaviness and pain in the lower extremities were the most frequently reported symptoms with severity approximating 6 and 7 on the VAS, respectively (Figures 2 and 3). The frequency of symptoms showed a tendency to be “regular all day” for most subjects (Figure 4). 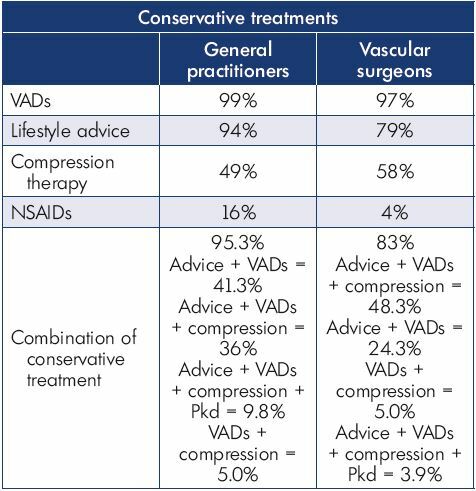 Vascular surgeons tended to prescribe compression therapy more often than did general practitioners (58% vs 49%) and fewer nonsteroidal anti-inflammatory drugs (NSAIDs). Figure 1. CEAP classification according to clinical severity. Figure 2. Patient-reported symptoms at the initial office visit. to the visual analog scale. Abbreviations: VAS, visual analog scale. Figure 4. Frequency of symptoms reported by patients. 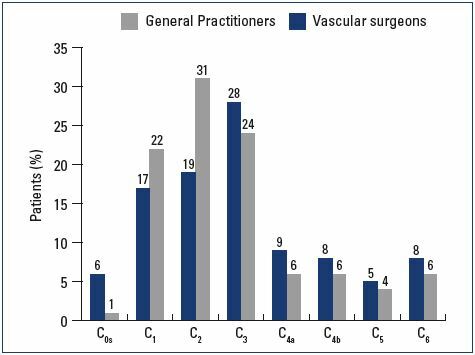 At the follow-up visit, both symptom relief and severity had improved with nonoperative management in both the general practitioner and vascular surgeon groups. 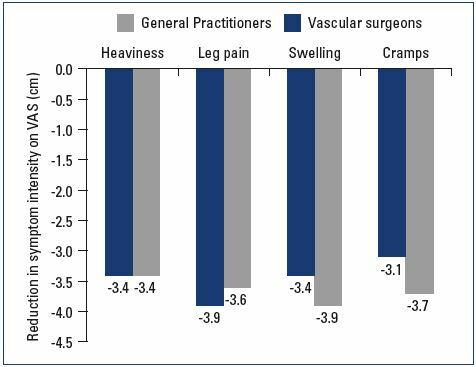 General practitioners tended to provide more lifestyle advice to their patients and achieve a better effect on leg swelling than did vascular surgeons (Table III). 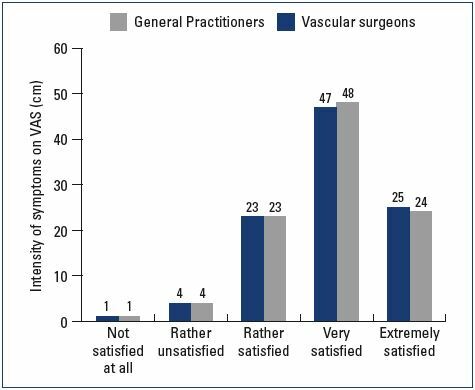 Patient satisfaction at the follow-up visit was similar in both groups; 47% and 25% of the patients in the general practitioner group were either “very satisfied” or “extremely satisfied” with their results, respectively, and 48% and 24% of the patients in the vascular surgeon group were either “very satisfied” or “extremely satisfied,” respectively (Figures 5 and 6). Figure 6. Patient satisfaction at the follow-up visit. The findings from the VEIN Act program suggest a reproducible trend of symptom improvement and satisfaction with MPFF treatment for complaints attributed to CVD. In both groups, physicians had a positive feedback from their patients, who expressed relief from pain, heaviness, swelling, and cramps. Participants of the VEIN Act program had overall beneficial results after the visit with their general practitioner or vascular surgeon. 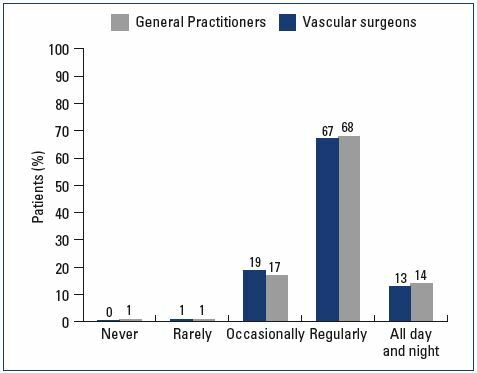 Prescribing habits varied between general practitioners and vascular surgeons concerning analgesics, compression stockings, and time spent educating the patient. The main habit that remained constant was the prescription of MPFF. 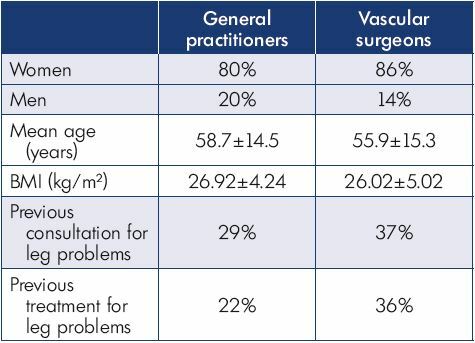 It could be inferred that vascular surgeons have more knowledge of the mechanics and formulation of compression stocking; thus, they prescribed them more often. Concerning symptom relief, the results were comparable between the two groups, except for swelling, where there was a slight between-group difference at the follow-up visit. In the design of our study, there was no standardized way of measuring edema or swelling; the physician was free to choose from clinical observation or objective quantification of edema using a measuring tape, the latter being more frequent during visits with a vascular surgeon. Overall, patient satisfaction and symptom relief remained favorable. The results of the program are in accordance with literature suggesting that a combination of physical and pharmacological interventions positively affect CVD symptoms.2,6 Immunopathological and molecular data show that alterations to the vein wall are responsible for the array of CVD symptoms, and these alterations serve as targets for pharmacological interventions.5,8-10 It is for this reason that patients received MPFF, as it has antiinflammatory, antioxidant, and phlebotonic properties. Compression stockings, on the other hand, serve as a support for the weakened vein wall and thus help reduce permeability11; it is clear that compression stockings could serve a key purpose in healing leg ulcers.7 Combining these strategies with the knowledge of CVD pathophysiology is indeed a wise practice. We consider that having no control of the groups and interventions is a limitation of the VEIN Act program because the results cannot be attributed to a single intervention, but to the multitherapeutic approach. On the other hand, our sample was diverse and large, showing that a complete set of interventions, including education, lifestyle modifications, and pharmacological and physical interventions seems to be the optimal way to treat CVD. We also reckon that the results from the VEIN Act program will be reproducible in other scenarios, which should be taken into consideration for applications elsewhere. Symptom relief from complaints attributed to CVD is achievable in a considerable group of patients by combining pharmacological interventions, such as MPFF, education, and the use of compression stockings. When formulating a treatment plan, it is crucial both to understand the pathophysiology of CVD and to learn how to treat this deleterious process. The VEIN Act program serves as guidance on how to intervene in CVD in an ambulatory setting. 1. Eklöf B, Rutherford RB, Bergan JJ, et al. Revision of the CEAP classification for chronic venous disorders: a consensus statement. J Vasc Surg. 2005;34(3):157- 161. 2. Gloviczki P, Comerota AJ, Dalsing MC, et al. The care of patients with varicose veins and associated chronic venous diseases: clinical practice guidelines of the Society for Vascular Surgery and the American Venous Forum. J Vasc Surg. 2011;53(suppl 5):2S-48S. 3. Eberhardt RT, Raffetto JD. Chronic venous insufficiency. Circulation. 2014;130(4):333-346. 4. Danziger N. Pathophysiology of pain in venous disease. Phlebolymphology. 2008;15(3):107-114. 5. Rabe E, Guex JJ, Morrison N, et al. Treatment of chronic venous disease with flavonoids: recommendations for treatment and further studies. Phlebology. 2013;28(6):308-319. 6. Wittens C, Davies AH, Bækgaard N, et al. Management of chronic venous disease: clinical practice guidelines of the European Society for Vascular Surgery (ESVS). Eur J Vasc Endovasc Surg. 2015;49(6):678-737. 7. O’Donnell TF Jr, Passman MA, Marston WA, et al. Management of venous leg ulcers: clinical practice guidelines of the Society for Vascular Surgery and the American Venous Forum. J Vasc Surg. 2014;60(suppl 2):3S-59S. 8. Yanushko VA, Bayeshko AA, Sushko SA, Litsy YSN, Nazaruk AM. Benefits of MPFF on primary chronic venous diseaserelated symptoms and quality of life: the DELTA study. Phlebolymphology. 2014;21(3):146-151. 9. Smith PD. Micronized purified flavonoid fraction and the treatment of chronic venous insufficiency: microcirculatory mechanisms. Microcirculation. 2000;7 (6 Pt 2):S35-S40. 10. Katsenis K. Micronized purified flavonoid fraction (MPFF): a review of its pharmacological effects, therapeutic efficacy and benefits in the management of chronic venous insufficiency. Curr Vasc Pharmacol. 2005;3(1):1-9. 11. Perrin M, Ramelet AA. Pharmacological treatment of primary chronic venous disease: rationale, results and unanswered questions. Eur J Vasc Endovasc Surg. 2011;41(1):117-125. 12. Gohel MS, Barwell JR, Earnshaw JJ, et al. Randomized clinical trial of compression plus surgery versus compression alone in chronic venous ulceration (ESCHAR study)–haemodynamic and anatomical changes. Br J Surg. 2005;92(3):291-297. 13. Gohel MS, Barwell JR, Taylor M, et al. Long term results of compression therapy alone versus compression plus surgery in chronic venous ulceration (ESCHAR): randomised controlled trial. Br Med J. 2007;335(7610):83. 14. Lishov D, Kirienko A, larionov A, Chernookov A. Patients seeking treatment for chronic venous disorders: Russian results from the VEIN Act program. Phlebolymphology. 2016;23(1):44-52. 15. Maggioli A. Chronic venous disorders: pharmacological and clinical aspects of micronized purified flavonoid fraction. Phlebolymphology. 2016;23(2):82-91. 16. Martinez-Zapata MJ, Vernooij RW, Uriona Tuma SM, et al. Phlebotonics for venous insufficiency. Cochrane Database Syst Rev. 2016;(4):CD003229. 17. Scallon C, Bell-Syer SE, Aziz Z. Flavonoids for treating venous leg ulcers. Cochrane Database Syst Rev. 2013;(5):CD006477. 18. Ramelet AA, Boisseau MR, Allegra C, et al. Veno-active drugs in the management of chronic venous disease. Clin Hemorheol Microcirc. 2005;33(4):309- 319. 19. Jantet G. Chronic venous insufficiency: worldwide results of the RELIEF study. Angiology. 2002;53(3):245-256. 20. Rabe E, Stücker M, Esperester A, Schäfer E, Ottillinger B. Efficacy and tolerability of a red-vine-leaf extract in patients suffering from chronic venous insufficiency–results of a double-blind placebo-controlled study. Eur J Vasc Endovasc Surg. 2011;41(4):540-547.